Status: Fairly common regular spring and fall migrant west and extreme west-central, rare casual elsewhere. Fairly common regular breeder west and extreme southwest. Hybrid zone between Baltimore and Bullock’s orioles shown in the area with cross-hatching with pure Bullock’s Orioles occurring in western Nebraska west of the dashed line. Documentation: Specimen: UNSM ZM7010, 19 Jun 1901 Indian Creek, Sioux Co.
Taxonomy: Two subspecies were recognized (Pyle 1997, Clements et al 2016), although these were synonymized by Flood et al (2016) and Gill and Donsker (2017), as followed herein. Hybridization occurs between this species and Baltimore Oriole (Rising 1970, 1996; Carling et al 2011), causing their taxonomic status to be controversial (AOU 1998). AOU (1983) lumped them as a single species, Northern Oriole, but returned both to full species status (AOU 1998) based on absence of free interbreeding at some locations resulting in a stable hybrid zone (Rising 1996, Carling et al 2011). Furthermore, “the two species differ in plumage, vocalizations, physiologic traits, molt, nesting ecology, and allozyme frequency to a degree greater than in any other birds generally treated as single species” (DeBenedictis 1996). Recent genetic studies suggest that the closest relative of Baltimore Oriole is actually Black-backed (Abeille’s) Oriole (Icterus abeillei) and that Bullock’s Oriole is a member of the Streak-backed Oriole complex (Flood et al 2016). 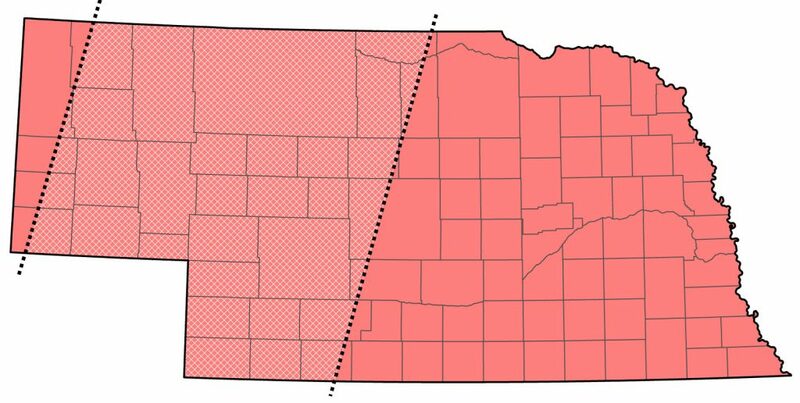 Short (1961) considered the hybrid zone rather wide in Nebraska, with its center a line from Big Springs, Deuel Co to just west of Valentine, Cherry Co (see map above). Short found pure Baltimore Orioles west to Hastings, Adams Co, St. Paul, Howard Co, and Spencer, Boyd Co, and pure Bullock’s Orioles east only to Chadron, Dawes Co, and Big Springs. However, hybrids outnumbered pure Baltimore Orioles east as far as Blair, Washington Co, and “obvious hybrids” occur in the northwest in summer (Rosche 1982). Youngworth (1955) and Mossman and Brogie (1983) found Baltimore Orioles predominant in the Niobrara Valley Preserve, although hybrids were seen during breeding season. Both Baltimore and Bullock’s Orioles have been reported at NNF Bessey, Thomas Co (Bray 1994). Jaramillo and Burke (1999) stated “If anything, there is evidence for an eastward invasion of Bullock’s genes, but not the opposite”. In Keith Co, Brown et al (1996) found that 116 of 176 birds examined (not all were nesting birds) were phenotypic Baltimore Orioles, and 41 showed evidence of hybridization, the remainder apparent Bullock’s Orioles. Of six orioles seen on the Dalton BBS route 18 Jun 2006, five were hybrids, the other a female Bullock’s Oriole. It is possible that the incidence of Bullock’s Oriole and introgressants east of the Panhandle has been reduced since the westward spread of Baltimore Oriole (Corbin and Sibley 1977). Currently (2016), the width of the hybrid zone, about 200 miles, is stable; despite routine hybridization, there is little evidence of interbreeding outside of the hybrid zone (Carling et al 2011, Flood et al 2016). There are phenotypically pure adults of both Bullock’s and Baltimore Oriole in the hybrid zone, suggesting that assortative mating is occurring; one factor leading to this is that the number and timing of molts differ strikingly between these species (Rohwer and Johnson 1992, Flood et al 2016), and another is the putative difference between the two species in ability to thermo-regulate (Carling et al 2011, Rising 1996). Observations in Scotts Bluff Co suggest that as Baltimore Orioles moved west in the 1980s and came in contact with Bullock’s, hybrids were common, possibly since the the first birds westward may have been mostly males (as was the case with Blue Jays after they entered northeastern Colorado, Bill Kaempfer, pers. comm.) but as numbers of Baltimore Orioles increased in western Nebraska and assortative mating became an option, hybrids became less common. This sequence was observed in a Mitchell, Scotts Bluff Co yard by Kathy DeLara (pers. comm. ); there was a Bullock’s paired with a Baltimore in 2007 and numerous hybrids for several years, but only one hybrid in 2017 and none in 2018 and no phenotypic Baltimores during those two years. Bullock’s Oriole is found east of the Panhandle during spring migration, but only to a limited extent. Of several reports in the period 30 Apr-25 May, all are since 2003 and most from the North Platte River Valley: eight in Keith Co 2-20 May, and two from Lincoln Co 7 and 15 May. Elsewhere, there are only three reports: one was in Hitchcock Co 14 May 2010, a singing male was in Arthur Co 20 May 2007, and a single was at Venango, Perkins Co 8 May 2016. There are no documented reports further east, although Swenk (Notes Before 1925) reported a specimen in the Olson Collection purportedly taken at Kearney, Buffalo Co Jun 1915, but provided no details. Additional undocumented reports of adult males in the east-central and east are 5 Jun 2005 Buffalo Co, 3-18 Jun 2006 Seward Co, 15 Jun 2001 Douglas Co, and 17 May 2006 Fontenelle Forest, Sarpy Co. There are two spring records of Bullock’s Oriole in Iowa, both in May (Iowa Ornithologists’ Union 2017, Kent and Dinsmore 1996). High counts: 18 in the Panhandle 28 May 2001 and 12 in one bush in Kimball Co 28 May 2011. Summer: Short (1961) found pure Bullock’s Orioles eastward only as far as Dawes and Deuel Cos; a nest was found in a ponderosa pine on the Bighorn Escarpment nine miles southwest of Redington in Morrill Co 10 Jun 2000 (Mollhoff 2001). Mollhoff (2016) showed little change in distribution between the first and second breeding bird atlas periods (1984-1989 and 2006-2011); breeding was confirmed throughout the Panhandle, east to Sheridan, Deuel, Chase, and Dundy Cos. There are nesting season reports without evidence of nesting east to Keith and Garden Cos, as well as one in extreme southwest Cherry Co (Mollhoff 2016). Keith Co reports include a “pure male” at Lake McConaughy, Keith Co 13 Jun 2002, another there 21 Jun 2005, a female photographed near Lake McConaughy 26 Jul 2014 along with three apparent hybrids, and a female in an Ogallala, Keith Co yard during summer 2013. There are no records of phenotypic Bullock’s Orioles nesting in the Keith Co area (Brown et al 2012). A singing male was near North Platte, Lincoln Co 14 Jun 2011. In the southwest, one was in Perkins Co 30 Jun 1972, and in 2011 three were reported: singles were in Frontier Co 13 Jun, at Wellfleet, southeast Lincoln Co 1 Jul, and in Chase Co 2 Jul. Perhaps the easternmost report in the state is of one seen near Eli, Cherry Co, 23 Jun 2006. Since the 1960s the range may have contracted somewhat as Baltimore Oriole has extended its range westward into northeast Colorado (Andrews and Righter 1992; Corbin and Sibley 1977). Near Crook, Colorado, between the 1950s and 1970s, the percentage of Baltimore Orioles increased while the percentage of intergrades and Bullock’s Orioles decreased (Corbin et al 1979). Bray (1994) made no mention of recent reports of Bullock’s Oriole in the Thomas Co area, although Bullock’s were said to have occurred there some 50 years prior. According to Bates (1900), Bullock’s Oriole was “very common at Long Pine” in Brown Co; he did not list Baltimore Oriole for that area. BBS trend analysis shows an annual statewide increase of 1.03% (95 C.I. -2.98, 5.50) 1966-2001, but suggests a more recent decline of -2.70% (95% C.I. ; -14.30, 6.42) 2005-2015 (Sauer et al 2017). Reports of this species east of the Panhandle are few, and most recent occurrences probably represent hybrids exhibiting Bullock’s Oriole characters. Brogie and Mossman (1983) found only hybrids and Baltimore Orioles in the Niobrara Valley Preserve, as did Rosche (1994) and Brown et al (1996) in the Keith Co area, where Bullock’s Oriole was thought to have decreased as a breeding bird in recent years (Brown et al 1996). An easterly hybrid was one in southwest Custer Co 5 Jun that “came in very nicely to a Bullock’s Oriole song played on my phone – was a lighter orange than most male Baltimores but had full black hood” (TJ Walker, pers. comm.). Departure begins in Jul, and is completed in early Sep, with late reports of an adult male near Mitchell, Scotts Bluff Co 18 Sep 2010, an immature photographed near Mitchell 25 Sep 2008, and 3 Oct 1969 Scotts Bluff Co. There are two fall reports from Lincoln Co, 9 Aug 2011 and 11 Sep 2008. This species undergoes a molt migration in fall (Pillar et al 2016), with adults usually departing early; the last male at a Mitchell feeder in 2008 was seen 13 Jul and on the same date in 2018. At this same feeding station near Mitchell in 2009, four families with young were in attendance. The males were absent and apparently departed when the juveniles were able to feed themselves; the females and juveniles were absent and had apparently departed together a month later, around mid-Aug (Kathy DeLara, pers. comm.). In 2010 at the same feeder, only females and an immature were present 31 Jul, and in 2012 a young male (possibly a hybrid) was last seen 1 Sep. There are three reports of Bullock’s Oriole in the eastern half of the state. A group of five, including an adult male Bullock’s and four immature or female birds, possibly hybrids, was at Alma, Harlan Co 11 Aug 1999, an adult male was carefully studied at Fontenelle Forest, Sarpy Co 4 Sep 2004, and a female was at Lake North, Platte Co 21 Aug 2006. There are seven fall reports of Bullock’s Oriole in Iowa, two in Sep, two in Nov (one of which wintered through Mar), and three in Dec (Iowa Ornithologists’ Union 2017). Photograph (top) of a Bullock’s Oriole at Sowbelly Canyon, Sioux Co 26 May 2012 by Phil Swanson. Carling, M.D., L.G. Serene, and I J. Lovette. 2011. Using historical DNA to characterize hybridization between Baltimore Orioles (Icterus galbula) and Bullock’s Orioles (I. bullockii). Auk 128: 61-68. Corbin, K. W. and C. G. Sibley. 1977. Rapid evolution in orioles of the genus Icterus. Condor 79: 335-342. DeBenedictis, P.A. 1996. Fortieth supplement to the AOU check-list. Birding 28: 228-231. Flood, N.J., C.L. Schlueter, M.W. Reudink, P. Pyle, M.A. Patten, J.D. Rising, and P.L. Williams. 2016. Bullock’s Oriole (Icterus bullockii), version 3.0. In The Birds of North America (P. G. Rodewald, Editor). Cornell Lab of Ornithology, Ithaca, New York, USA. https://doi.org/10.2173/bna.bulori.03. Iowa Ornithologists’ Union. 2017. Iowa Records Committee reports of Iowa rare bird records, accessed February 2018. Pillar, A G., P.P. Marra, N.J. Flood, and M.W. Reudink. 2016. Moult migration in Bullock’s Orioles (Icterus bullockii) confirmed by geolocators and stable isotope analysis. Journal of Ornithology 157: 265-275. Rising, J.D. 1970. Morphological variation and evolution in some North American orioles. Systematic Zoology 19: 315-351. Rising, J.D. 1996. The stability of the oriole hybrid zone in western Kansas. Condor 98: 658-663. Rohwer, S., and M.S. Johnson. 1992. Scheduling differences of molt and migration for Baltimore and Bullock’s orioles persist in a common environment. Condor 94: 992-994.